Here they are! 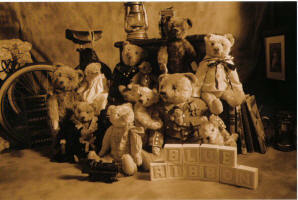 The Blue Ribbon Bears Greeting card selection. The results of quite a journey and we are delighted with the result. This Exclusive range of Greetings cards features some of my favourite antique teddy bear boys and girls (girl!) 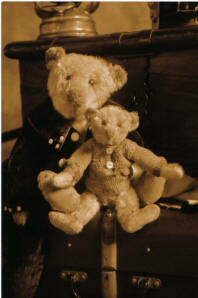 of course Connery and all his Bing friends feature on one, "Connery" and lovely little "Bling" on another, Galileo my old boy Steiff with little Lord Lancaster on a third and a whole family group of Blue Ribbon Bears on another. 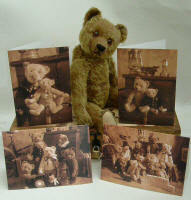 All the cards are A5 in size, so are larger than most normal greetings cards. They have been produced this size to enable you to frame the cards if you wish and of course to ensure that when you send these, you like I , will feel that the recipient is getting a very special card! 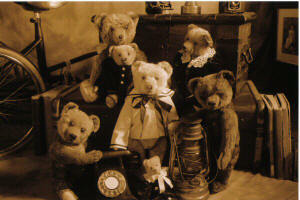 They are printed on a very high quality 300g stock silk card and the details of each bear is printed on the reverse. There are four cards to a pack , one of each design. The cards come with high quality envelopes in a clear cellophane sleeve. 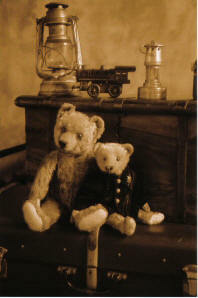 Each card features a sepia photograph of the bears in a traditional setting. Connery took his Bing train along for his! They can be mailed as gifts if you wish, simply request this on your order and leave the rest to us. £10.00 for 4 packs!! That is 16 cards for £10!